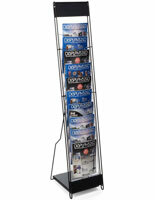 This curved portable literature rack is perfect for holding sales materials, magazines, retail merchandise and more. 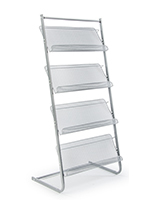 Each 4-tier commercial or store stand is 55" tall and comes with a 17.5" x 5.5" header frame for pricing or information displays. 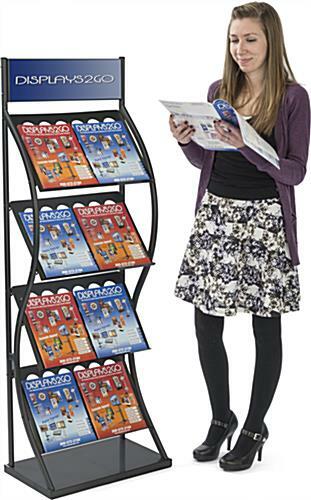 The black finish portable literature rack is made from steel and features a unique curved front that draws the attention of passers by. 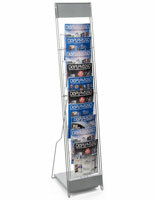 Each of the four lipped brochure trays is wide enough to showcase two magazine displays on each level. The lightweight literature rack assembles and disassembles easily to fit in the included black carrying case with shoulder strap. 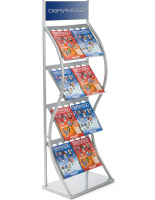 This versatile brochure stand complements any environment and is a great choice to draw attention to anything from sales circulars to retail merchandise or reading material. 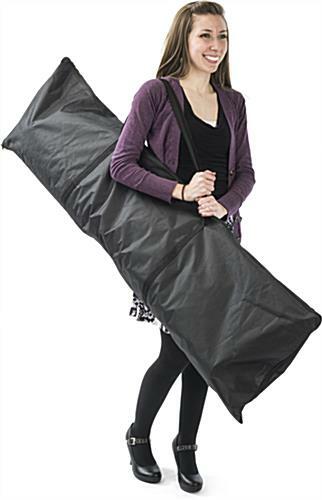 32.0" x 55.0" x 11.8"
17.8" x 13.0" x 0.75"
19.5" x 1.0" x 11.8"
17.5" x 5.5" x 0.75"
56.0" x 14.0" x 5.0"